Established by Sitra, the Helsinki Metropolitan Smart & Clean Foundation is turning the Helsinki capital region and Lahti into a world-class test platform for clean and smart solutions that our urbanising world needs in order to reduce its dependence on fossil energy. The objective is for the Helsinki capital region and Lahti to offer the best solutions for the challenges facing the world’s cities and serve as a window on Finnish and international companies. 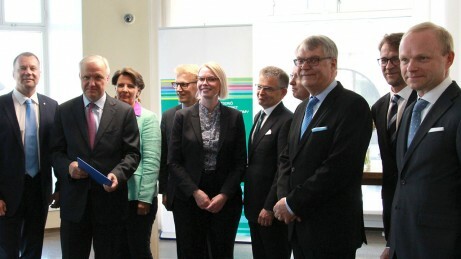 The partners in the new foundation are the cities of Helsinki, Espoo, Kauniainen, Vantaa and Lahti, several companies, the Finnish state and the Helsinki–Uusimaa Regional Council. The foundation has an operating period of five years. During this time, it will compile and produce projects that will create business opportunities in the region based on clean and smart solutions. Among other things, the solutions concern transport, food, housing and energy. The outcome of this work will be products and services that can be adapted for the everyday activities of residents and companies in the area. Rather than simply distributing traditional funding, this foundation links those in both the private and public sectors – cities, companies, residents and the scientific world. The Smart & Clean foundation will work with these actors to produce project entities that result in new solutions, products and services for transport and living. Export concepts will be developed at the same time. The foundation’s activities are funded through donations. According to the target budget, the five-year funding requirement is some 7.5 million euros. One third of this comes from cities in the region, another third from Sitra and the final third from businesses. Channelled through the Ministry of Employment and the Economy, the Finnish state’s share will be allocated to the Smart & Clean projects in the cities as part of a Stability and Growth Pact. Tiina Kähö has been appointed managing director of the foundation and will begin her work on 1 June 2016. She joins the foundation from her previous position as Senior Lead in Carbon-neutral industry at Sitra. The foundation’s activities strengthen the capital region’s position as a region that responds to future needs. Joint development of internationally significant solutions combining intelligence and environmental expertise is based on more open use of the cities’ data reserves and infrastructures. Over a five-year period, some 20 to 30 project entities will be produced and tested in practice. The first targets include public transport that produces no carbon dioxide emissions and cities with zero waste. What opportunities does the foundation create in the region? What kind of milestone is this in terms of city co-operation in the region? How can companies benefit from the test platform offered by the cities? – Pekka Manninen, Managing Director, Helen Ltd.